World-leading innovator and provider of imaging solutions. Canon believes in the power of image: the power to communicate quickly and easily, to convey the slightest of subtleties, to elicit the strongest emotions and to simplify the most complex of tasks. Canon’s professional HD Video lens technology delivers a superb 30.4mm, F1.8 lens with a smooth, 10x optical zoom, and 8-Blade iris for natural looking de-focus effects. 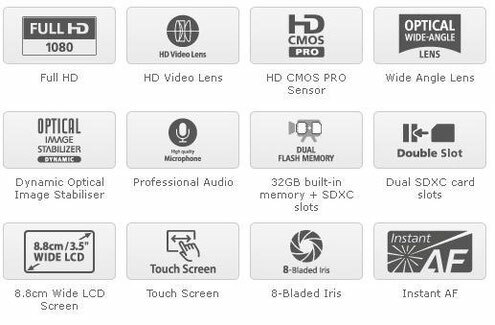 A 2.07 MP HD CMOS Pro sensor - designed and made for professional camcorders - captures Full HD at native 1920x1080 resolution. The light gathering area of the pixels is 160% greater than a conventional CMOS, for wider dynamic range and better low-light performance. The new, high sensitivity built-in microphone has 4 directionality modes to ensure you capture more of the sound you want and an audio equaliser for the perfect tone. A zoom mic option is available and, when used with an external mic, the 2 sources can be mixed in camera. Optional Canon 5.1 Surround and Wireless mics are also available. 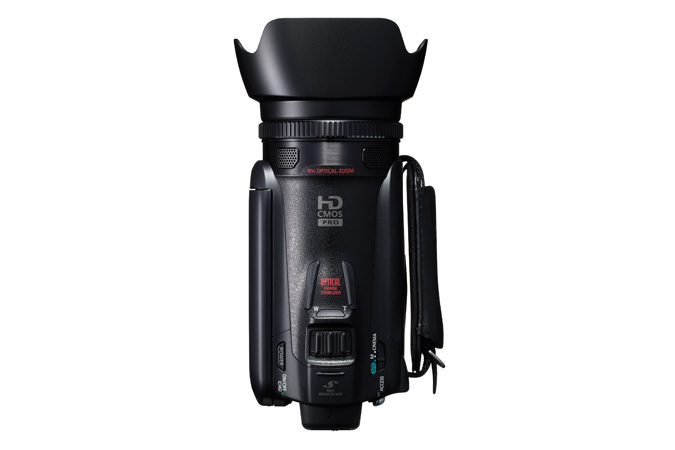 Full HD AVCHD video is recorded at up to 24mbps to 32GB built-in flash memory – for over 12 hours recording. Dual SDXC card slots and Relay Recording ensure enough capacity for the most ambitious movie projects. A lens focus ring gives you precise control of manual focussing, while an assignable Control Dial allows control of functions such as aperture, shutter speed and gain. Professional shooting assist functions include Magnification, Peaking and Zebras. A high-resolution 920k dot, 8.8cm Touch-screen LCD is optimised for shooting in HD and provides 100% coverage of the scene. A retractable, colour viewfinder adds to your shot-framing options. An advanced Optical Image Stabiliser ensures smooth, steady video every time. Dynamic mode stabilises shots on the move, while Powered IS delivers steady telephoto shots. Inspire your creativity with built-in Cinema-Look Filters. Select from 8 adjustable colour-grading filters to capture the perfect looking movie scene. Shoot progressively at 25 full frames per second for a more cinematic feel. In-camera HD-SD conversion lets you down-convert your movies to standard definition, ready for uploading and sharing via the web. "The Canon Legria HF G10 is quite simply the high-end of camcorders on the market today. The look and technical capabilities are clearly of the highest professional order. Highly recommended!" "Here we have a product that surpasses all others because of its focus on video. The increased size of the sensor ensures an amazing image quality even in low light and makes all the difference." 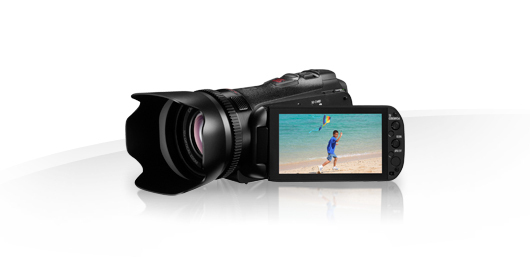 "The Canon LEGRIA HF G10 is for the pros but also friendly. It combines the ability to make manual adjustments and the tools to really work creatively; it's just incredible." 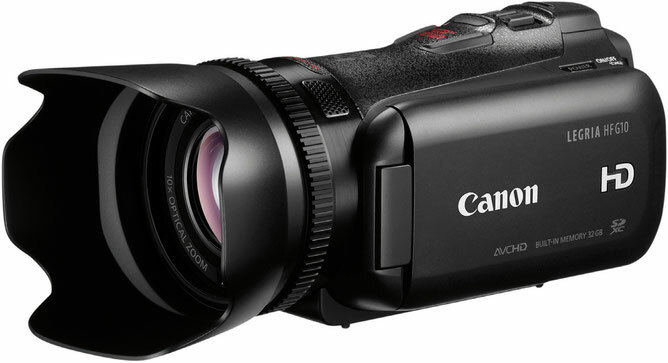 "True HD, professional, with a wide angle lens, a powerful image stabilizer and an internal microphone that gives top end sound quality; the Canon G10 Legria really has it all." "I have rarely seen image quality and optical performance of such calibre, such perfection…"
"The optical stabilization makes it a cut above the rest of competing products, no image distortion, incredible stability for a professional result, it's just perfection." "This camcorder surpasses all other camcorders with the simplicity of its functions: you can create scenarios, add titles and produce effects extremely easily. No need for post-production, you can do anything from this camera, it’s is truly amazing." "This is the best product of its range, and certainly the best I have seen in years!"